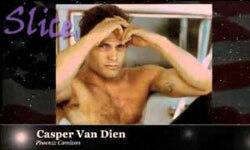 Today’s guest, Casper Van Dien, talks about his latest film project, “The Pact”, and about his upcoming appearance at Phoenix Comicon, May 24-27 2012. Listener comments: If you have questions or comments on any news items or scifi projects, or topics that are relevant to our favorite entertainment genre, Call our show and ask! You can leave your message at 206-339-TREK, and if your questions are brief and clear, or if your comments are fall-down funny, you just might hear them on the show! Keep Slice of SciFi going and growing. Please donate and help us continue bringing you the best scifi and genre related news and entertainment available on the web and on Sirius-XM Radio. You can be a monthly contributor, or a one-time donation supporter — either way, we thank you.